When I was a young, elementary school kid, I remember seeing my older sister constantly burying her nose in a book. One of those book covers started my own love of reading. 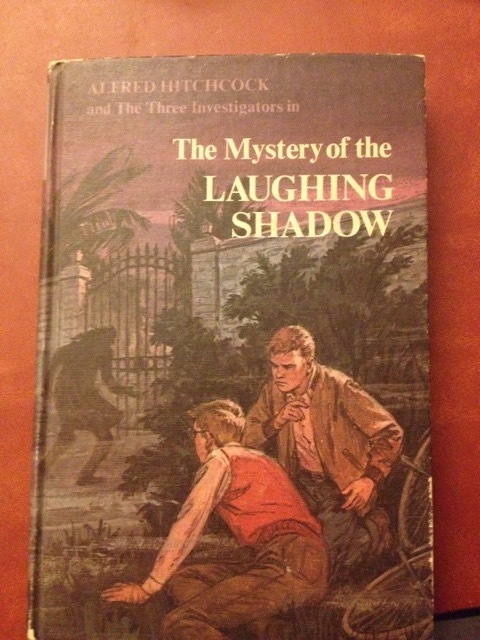 ALFRED HITCHCOCK AND THE THREE INVESTIGATOR’S IN THE MYSTERY OF THE LAUGHING SHADOW. That cover spurred my imagination and made me excited to plunge into the mystery playing out on the pages inside. It was the first novel I ever read, and I didn’t stop there. I went on to devour every Three Investigator book I could get my hands on. TERROR CASTLE, THE WHISPERING MUMMY, SKELETON ISLAND, THE FIERY EYE, THE TALKING SKULL, THE SCREAMING CLOCK, THE GREEN GHOST, THE FLAMING FOOTPRINTS, THE HAUNTED MIRROR, THE SHRINKING HOUSE, and THE PURPLE PIRATE all still hold a cherished corner of my mind.